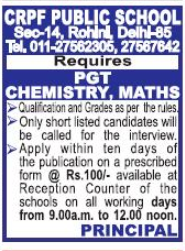 CRPF Public School, New Delhi has advertised in THE HINDUSTAN TIMES newspaper for the recruitment of PGT job vacancies. Interested and eligible job aspirants are requested to apply with in 10 days. Check out further more details below. About School: C.R.P.F. Public School was founded in May 1988. It is an upcoming institution, which continues to add programmes and facilities needed today to meet the challenges of the 21st century. The need of a school to run on public/progressive lines was realized by the C.R.P.F. Education Society and to provide quality education to the children of C.R.P.F. personnel, who are on duty in far-flung areas, fighting insurgency or tackling various law and order problems. So, to have better standards of education and a comprehensive view of the world, it was decided to start a school which would benefit these children.